It’s an age old problem. 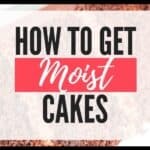 How to get a moist white cake. You try recipe after recipe and either they taste like cornbread, the texture isn’t good, or it just isn’t moist enough. So, you end up just going for a box when you really wanted to make something with that ‘scratch wedding cake taste’. 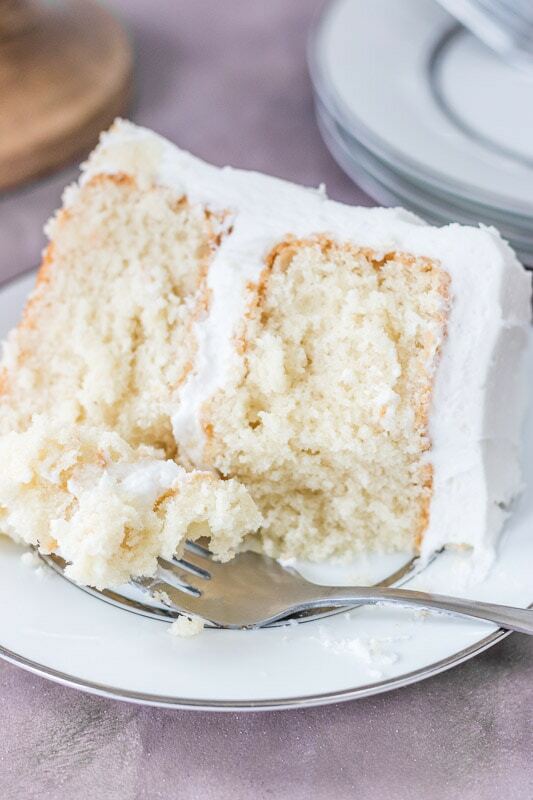 You may have seen my Favorite Vanilla Bean Cake recipe on the blog. If not, go and check it out…it’s so moist and really tasty. It’s my favorite, hence the name, but I wanted to see if I could get a truly ‘white’ cake and I wanted to get that wedding cake flavor. Well I think I’ve done it. 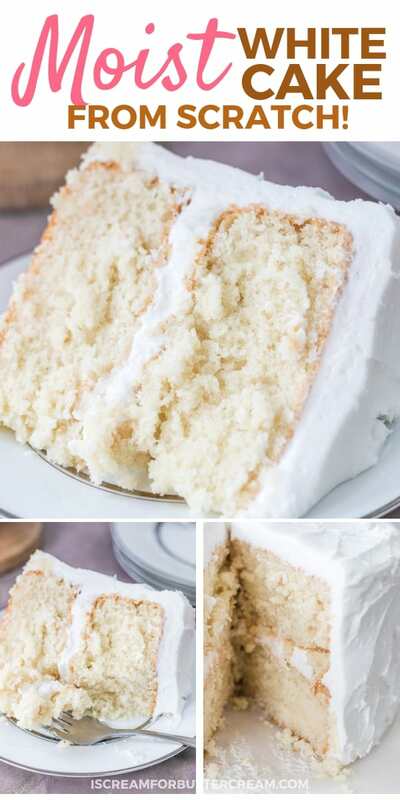 This cake is actually a white cake that is actually moist, AND it’s got that wedding cake taste. So, when trying to get a cake as white as possible, I wanted to use only egg whites. Generally, using only egg whites can tend to dry out a cake a bit, so you have to add a bit more moisture. Now, I like a buttery taste to my cake, but in the effort to try and get a ‘whiter’ cake, I lessened the amount of butter and substituted the rest with shortening. 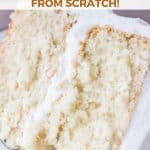 If you want an all butter cake recipe (using no shortening), you’ll want to check out my vanilla cake recipe. Another thing to note is that you can use either all purpose flour or cake flour for this recipe. The amounts will differ and that’s noted on the printable recipe below. 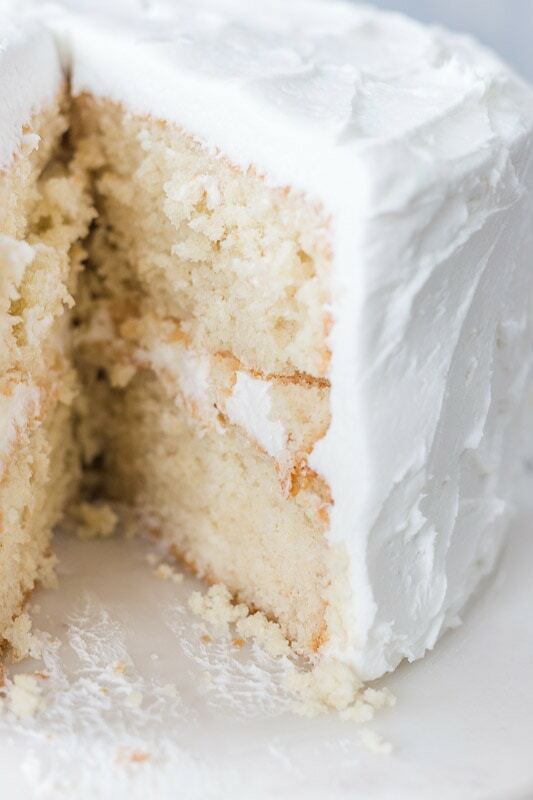 Here’s the deal though: Using cake flour will give you a whiter cake. I’m not a scientist or anything, but I think it’s because the cake flour seems to be more bleached than the all purpose. I could be wrong, but regardless, you’ll get a whiter cake using cake flour. Now let’s talk about the flavoring that’s added in. Of course it’s optional for you, but I think it really takes it to the next level. First it’s the vanilla. You can always use clear extract to make sure it’s not adding any additional color to the batter, but I tend to use regular vanilla because honestly, it’s just better. If you can get it, try to use vanilla emulsion…it’s amazing. Second, I added in my favorite flavor booster…almond emulsion. You’re using just a touch of it, so you won’t really get an ‘almond taste’. It just adds to the flavor. Seriously most people won’t even know you’ve added it in there…they’ll just know it tastes amazing. Ok, if you just can’t stand the thought of adding it, or you don’t have any handy, then don’t worry, it’ll still taste good. Oh and the emulsion is much better than the extract. The extract just does not taste good to me. Lastly I added in a bit of butter flavoring. Since I’d replaced some of the butter with shortening, I wanted to add back in some flavor. Now, that part is optional, but it really seems to give it that wedding cake flavor. The butter flavoring you can get at the grocery store is gross to me…now that’s just my opinion. I feel like Lorann’s Butter Emulsion tastes much better. 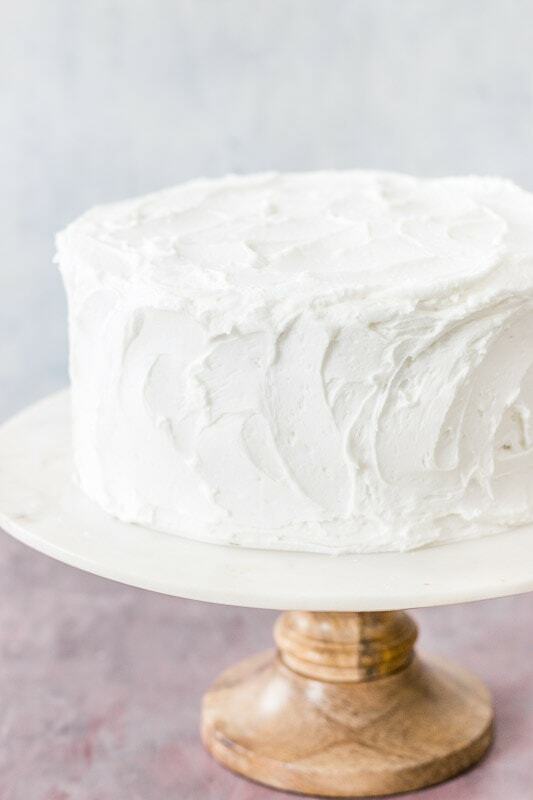 You’ll also want to check out my vanilla bean buttercream recipe…it goes perfectly with this cake, but if you’re looking for a bright white buttercream, you’ll want to check out that recipe here: Bright White Heat Stable Buttercream. Can I substitute the baking soda or baking powder? No, you don’t want to do that. What is shortening? It’s basically just fat. I use vegetable shortening like Crisco, not lard which is animal fat. This helps get the cake moist and I use this in place of most of the butter to keep the color as white as possible. Why are you still adding in butter if you’re using the shortening? Because I like the taste of butter. You just can’t beat butter in a cake. Can I microwave my butter to get it to room temperature? I don’t recommend doing that. It could get too warm and will heat up unevenly. That could mess with the texture of your cake. Just set the butter out on your counter and let it warm up to almost room temp. It’s ok if it’s a little cooler than room temp…you just don’t want it warm. Can I just use milk instead of sour cream? You can, but the cake won’t be as moist and the texture and taste may be a little different than the original recipe. I don’t have clear vanilla extract. Is that necessary? No not really. 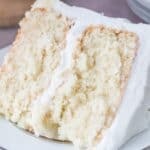 Actually regular vanilla extract or vanilla bean emulsion (or paste) tastes better, but clear will help keep the cake white if that’s really an important factor for you. Do I have to use the almond emulsion? No. Some people just don’t like almond taste, but I will tell you that if you haven’t tried it, you might actually like the small hint of it. A lot of people assume they won’t like it, but honestly I think it tastes different than what most people think it would taste like. And you’ll just be adding a touch of it, just enough to add a little flavor. Do I have to add in the butter extract? No, but I think it adds a little more butter flavor and that in combination with the vanilla and almond emulsion are what gives it that classic wedding cake taste. Where can I get butter extract, almond emulsion and vanilla emulsion? I’ve got links just below the recipe card for the ones that I like to use. Anymore questions? Just let me know. I’m happy to help. Ok, I won’t talk your head off anymore…let’s get straight to the recipe! 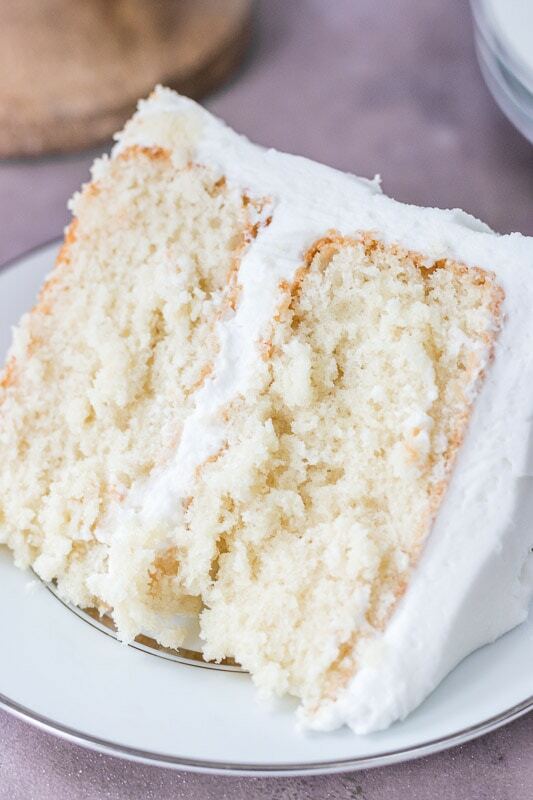 A scratch white cake that's actually moist, with a soft texture and oh so delicious with that wedding cake flavor. Grease and flour two 8 inch round (2 inch deep) cake pans. You could also use three 6 inch round pans. In a bowl, mix together the sour cream, milk, vanilla extract, almond emulsion, butter extract and egg whites. In a large mixing bowl, add the flour, sugar, baking soda, baking powder and salt. Add the shortening and butter in chunks to the flour mixture. Mix until the flour is coated with the shortening and butter. The mixture will be crumbly. Add in half the liquid mixture and mix just until combined. Add in the last half of the liquid mixture and mix just until combined. Scrape down the sides of the bowl and then mix again, only for 10-15 seconds. You want to be careful not to over-beat the batter. Pour into the greased and floured cake pans and bake at 325 degrees for 45-50 minutes. Cool on a wire rack then cover with buttercream. Make sure to read the FAQs above the recipe card for common questions and answers about this recipe. Was wondering if this cake is dense enough to stack and/or cover with fondant? Karen, It should be fine. I have not tried it under fondant yet, but I can’t think of any reason it wouldn’t work. 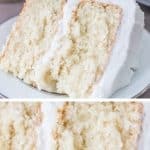 It’s very similar to my favorite vanilla bean cake recipe and that has always worked fine for me under fondant and stacked. Hi Diane, I haven’t made cupcakes with it yet, but I’m sure it will be just fine. 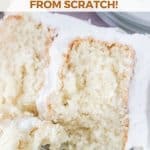 My vanilla bean cake recipe is very similar and it works great as cupcakes, so there’s really no reason this recipe wouldn’t work. I’d fill the cupcake liners about 2/3 of the way up, bake at 350 degrees and start checking them at about 20 minutes. It’ll probably take them about 25 minutes or so to bake. Could you make this recipe to fit 2 -9 inch rounds by halving this recipe and then adding the half to the whole? If I’m making myself clear! Or just double the recipe and make 3- 9 inch rounds? I don’t want to chance changing the texture though. Thanks! Hi Robyn, I get what you’re saying. Actually, I think either way you described would work and doing a recipe and a half or just doubling the recipe shouldn’t change the texture. If I’m using extra large eggs, should I decrease the eggs? Hey your comment worked this time! I just needed to approve it…yay! Ok, I answered you earlier, but I’m going to answer again in case someone else comes along and has the same question…AND I’m amending my answer just a tad from this morning. It will ‘probably’ be okay to use extra large eggs instead of large eggs, but because it will add a little more liquid to the recipe, I can’t make promises. Even though I think it’ll be ok, to be on the safe side, I’d go with 5 extra large egg whites. Great! Good thinkin’ Lincoln. You’re absolutely right! Thank you very much. Can butter be substituted with vegetable oil. My short answer is maybe. 😉 Here’s what you could try: Instead of 1/4 cup of butter, just use about two tablespoons of vegetable oil and instead of adding it to the flour mixture with the shortening, just add the oil to the liquid mixture (when you mix the eggs, sour cream, milk and all that together). Hope that makes sense. I think this will work, but let me know how it goes! Hi! Researched so many “moist” white cake recipes and looking at the ingredients yours seems to sound like the better recipe… I want to really impress my guests.. a little nervous becouse the results I’m looking for is super moist … I’m going to follow it to the T I bake a lot so I trust it will turn out… I want to put a lemon chantilly cream with some blueberry it’s my daughters request for her Birthday… Can I use 9 inch pans? I’m serving 15 people should I double or triple the recipe? Hope to hear from you soon? I will be making this for the first time on Saturday! Do you think the cake taste better with or without the almond and butter extract ? Also, do you think that adding oil instead of butter will make the cake more moist ? Yes that should be fine. There is already baking soda in the recipe, so that will take care of some of the acidity…mainly from the sour cream, but the added 1/2 cup of buttermilk should be okay with the same amount of baking soda. If it’s a little too acidic, you might have to adjust the amount of baking soda and baking powder, but I’d try it first just using the buttermilk instead of the milk and no other changes and see how it goes. 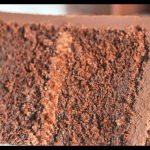 I want to make this in a 9×13 pan. Also, may I use regular extracts? Hi Dee, it should be fine baked in a 13×9 inch pan. You may watch it before it gets to the bake time listed in the recipe in case it bakes quicker. You can use any kind of icing you’d like on this one. Crusting buttercream will do just fine. Let me know what you think! Hi there. I don’t normally have an issue with this cake getting a dome on top, but I would say check your oven temp maybe with an oven thermometer and make sure it’s not running too hot. Make sure you’re baking it at 325 and not 350 as well. Also, if you’re using smaller pans (other than two 8″ round pans), then that could perhaps do it. I will say that personally I don’t really worry about cake domes, unless it’s a super high dome or something. I just don’t worry about getting my cakes to bake super flat because you can always just level them out with a cake leveler or knife, so I don’t worry about it too much. I hope this helps a little! Sour Cream- full fat (regular)? Hi Marie, Yes unsalted butter, full fat sour cream and whole milk if you can get it. The whole milk isn’t essential…you could use 2% if you want, but I think the whole milk works a bit better. I’ll go back and clarify those things on the recipe. Hi Linda, it should work the same, but I have not tried it that way, so I’m not sure about the taste. Might actually turn out kind of amazing though 😉 Keep me posted! I’m baking making my cake a day before serving it at my party. I know that the recipe calls for only egg whites (which are more drying than whole eggs). 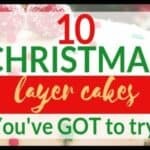 In my experience having cakes in the fridge overnight dries them out a bit. That combined with the fact that I’m only using egg whites makes me a bit concerned that the cake won’t retain the desired moisture. Will the cake still be moist after refrigerating it overnight? Hi Emilia, you’re correct that egg whites are more drying than using whole eggs. I added a bit more moisture and fat to this recipe to counteract that though. Another thing to note is that it’s not necessary to chill the cake unless you have perishable frosting on it. I usually don’t chill mine, but I understand if you’re more comfortable chilling them, or if it’s decorated a certain way and needs to be chilled. Generally if the cake is covered really well (like in a cake box) and iced, it’s sort of sealed against the drying affect of the fridge, but I understand your concern. Also, butter cakes will always firm up a bit when chilled, but they soften again once they come to room temp. Have you ever used vanilla sugar in any of your cake recipes? I got some from Hawaii and have been saving it for a special recipe. Hi Erin, I haven’t used it in a recipe yet, but I have heard of it and it does sound amazing. I don’t know why it wouldn’t work though. It’s my understanding that it’s regular granulated sugar that’s infused with vanilla. 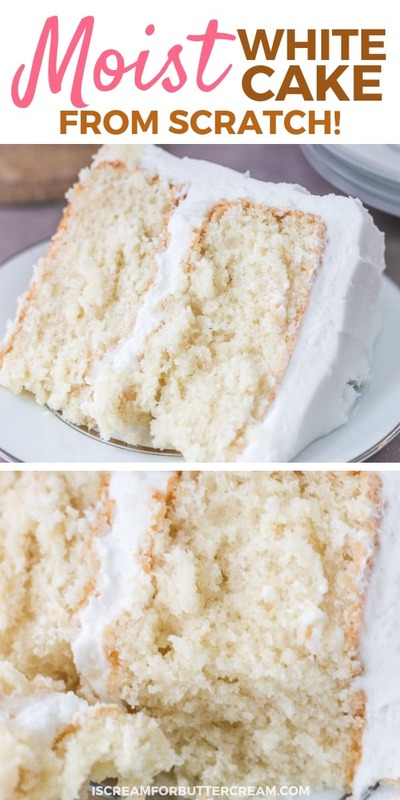 You might not need to add the vanilla extract called for in the recipe (or at least not as much), but I imagine that using the vanilla sugar would make an amazing cake. If you do try it, I’d love to hear how it turned out! Hi Kara, I am looking for a moist and flavorful Spice cake recipe. 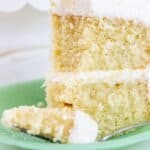 Can I use your moist vanilla cake recipe and just add the spices? That one is made with brown sugar and it gives it a bit of a richer, more deep taste to it. 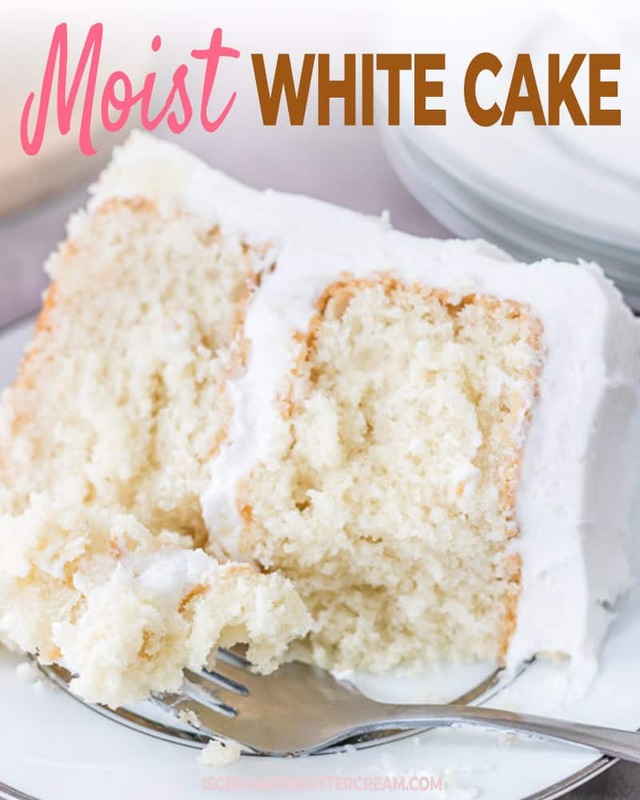 But if you really like the moist white cake and want to try just adding the spices to it, you can certainly do that. I think a spice cake tastes better with a more buttery cake though and the white cake doesn’t have much butter in it. You could also just try adding in the spices to the favorite vanilla cake, which does have more butter than the white cake. You can find that recipe here: https://iscreamforbuttercream.com/favorite-vanilla-bean-cake/ Hope this helps. I have been trialing white cake mix after white cake mix to try and absolutely love the flavor and crumb of this one. Crazy how little tweaks can change the entire density of a cake. Any suggestions on getting this to be a tad whiter? Oh yay!! So glad you like it! Yeah I agree…little changes in ingredients make a huge difference sometimes. As far as getting it whiter, I’ve made this a couple different ways and I’ve noticed when I use cake flour instead of all purpose, that it comes out a bit whiter. It’s weird, and I don’t really know the science behind that, but that’s what I’ve discovered anyway. I like using Swan’s Down Cake Flour (in case you want to try out that theory). Also, you could probably replace the butter with more shortening, but I really like using a small amount of real butter in there…I think it helps with the flavor and I’m not sure the small amount of butter would make a huge difference in the color. If you do replace the butter with more shortening, I’d add in just a tad bit more butter flavoring to offset it. The only other thing I can think of to make it more white is to use clear vanilla extract. It’s not as tasty as real vanilla extract, but it won’t tint your batter. Could you use almond flour instead of cake flour? Will buttermilk make it more moist? Hi Rebecca, this cake is moist as it is. If you’re wanting to use buttermilk in place of the regular milk that the recipe calls for, that probably wouldn’t make that much of a difference, since it’s only half a cup. Try the recipe first as written and see what you think and if you’d like to try the buttermilk instead of regular milk, then just sub it out, but don’t add any extra though, or it could throw off the ratios. I haven’t tried it with almond flour, so I really don’t know if that would work, or not.